A typical Japanese taxi cab. Public domain photograph from Wikimedia Commons. Today’s post is about the impeccable system of Japanese taxi cabs. I’ve been fortunate to take a few taxi rides in Japan, and I’ll probably have to rely on the taxis a little more when I visit next month. Japanese taxi cabs are impeccable, and there are many types to choose from… from the standard, bright colored taxi cabs, to the black cabs, to the high-octane or hybrid variety… if you happen to visit Sapporo, you might stumble upon a taxi decked out with your favorite Anime character. When you plan on using taxis in Japan, it might help you to figure out the cost beforehand. Public transit is the way to go in most cities in the country, as the fares for taxicabs are expensive (the usual “flag fare” is around 700 yen or so, racking up as you go). However, in rural areas a taxi might be the best way to your destination. Otherwise, traveling in groups of 3 or 4 in a taxi may prove to be as economic as regular public transit. And of course, in the late night when no public transit is to be had, it’s either the taxi way or no way. Today I would like to introduce two websites that I would recommend for finding out taxi fares. One is easy to understand and gives a fairly rough estimate, while the second is a little more precise but in Japanese. First, I recommend the Taxi Fare Finder website, which not only shows taxi fares for major Japanese cities but also for other cities around the world. Simply type in your starting and ending points (i.e. train stations, major attractions, etc) and it will plot the most direct route and show you an estimate of how much you can expect to pay. The other one, which I like especially, is the Japanese “Taxi Fare Simulator” offered by Nihon Kotsu (日本交通), which I believe is the largest consortium of taxi cabs in the Tokyo area. Note that I said: JAPANESE, which means you need to do this in Japanese…. Right? Well… there are a few tricks that you can use to get by. First of course, you’ll want to make sure that your web browser is set up to display Japanese characters. Input from Nihon Kotsu Taxi Fare Simulator. 経由地 is the “via” point, or the area that you would like to pass through on the way to your destination. 高速道路を使う asks the simulator to route you via the highway instead of regular roads, which may be faster but will probably cost more. Highway fares are not included in the fare estimate that it gives you, and will be added on to the fare at the end of the trip. So now we need to plug in the information, which requires some Japanese… or does it? The Nihon Kotsu simulator uses Google Maps… which means that your search may work if you type things out in English! Let’s take a look. Say we are arriving into Tokyo on the Shinkansen and we want to take a taxi to the hotel that we are staying at. In this case my random selection is a hotel I’ve stayed at before: The Sutton Place Hotel Ueno, which is not too far from Ueno station. Now press the orange button. If you did not enter a “via” point in the field labeled 経由地 then the simulator will try to find the most direct route to your destination…. Well what do you know, it DOES work in English! The fare is estimated to cost 2,240 yen from Tokyo Station to the Sutton Place Hotel Ueno. Below the fare you will see the breakdown per passenger for groups of 2, 3, or 4 (the maximum number of passengers the regular taxis will carry). Wow, 560 yen per passenger for a party of 4 is not too bad! GPS Code? Now this is interesting. Nihon Kotsu’s taxis are monitored by a Global Positioning System. This is used so that Nihon Kotsu can keep track of their taxis, and to dispatch them to calls. Apparently, specific locations are given a unique GPS code number. So the GPS Code for Tokyo Station is 404-1846-076A and the code for the destination hotel is 423-8446-567A. When taking a taxi, it helps to hand the driver a piece of paper with your destination printed or written in Japanese, as certain destinations in Japan can sometimes be difficult to find (especially in Tokyo where there are main roads and side roads all over the place!). But if you are traveling in Tokyo city on a Nihon Kotsu taxi, and you have this GPS Code written down, then it might be the easiest thing to show the driver the GPS code! Welcome to the wonders of modern Japanese technology. By scrolling down on the page, you can see the direct route that the simulator has plotted. You can try other destinations for yourself… Or if you are not satisfied with the route that you see, simply dragging points A and B on the map to desired start/end point will redraw the most direct route and re-calculate the fare. One more thing to add about Nihon Kotsu… while you can hail a cab by yourself along the road side, join an official taxi queue at a train station, or have your hotel call ahead for a taxi on your behalf, you can also call for a taxi yourself. If you are in Tokyo and have access to a telephone, Nihon Kotsu offers a 24 hour reservation hotline… in ENGLISH! They are currently the only company in Tokyo to offer a taxi booking in the English language. The telephone number is: 03-5755-2336. Tell them where you are and they will dispatch a taxi to you. 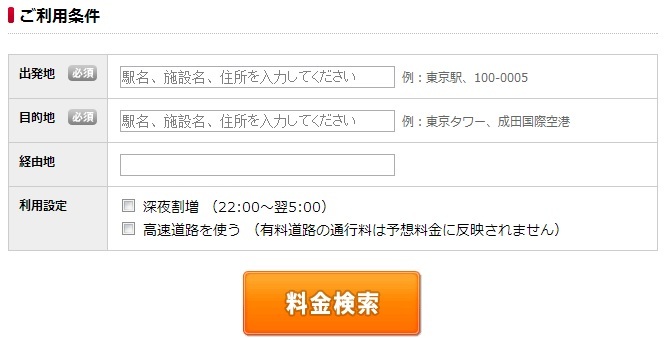 Note though that this booking service costs 400 yen, which is added on to the taxi bill at the end of your trip. 空車 – this means that the taxi is available. – At night, a lit light on the top of the cab is also an indication that it is available. – In most Japanese cabs, the driver will remotely open and close the left rear door, so don’t try to do this yourself. There are a small number of exceptions (i.e. MK Taxi cabs in Kyoto) where the taxi driver will come out and personally open the door for you. – There is luggage space in the rear of the taxi cab that can fit a couple of regular suitcases. – There is no tipping in Japanese taxi cabs… the fare that you see is the fare that you pay. Remember, any extra charges (such as highway tolls and reservation fees) are added in and paid at the end of your journey. – Don’t be alarmed if the taxi driver wears a neat uniform… this is the norm in Japan. All taxi cabs are kept meticulously clean inside and out, and drivers typically wear white gloves. In addition to the usual disclaimer, keep in mind that the fares shown in the above websites are estimates and may not factor in changes such as different routes, or driving in traffic conditions. Also, taxis may charge flat fares for certain trips (for example, from a major airport to the city, like Narita-Tokyo or Haneda-Tokyo). One final suggestion… be nice and courteous to your driver! They are typically courteous and it’s nice to offer the same in return, especially since they typically work long hours during the day. My research of a couple of promotional YouTube videos for Japanese taxi companies, particularly in Tokyo, infer that cab drivers work in shifts of 20-22 hours at a time! No wonder there are so many Japanese taxi cabs and drivers to go around.